Born and brought up in Bombay, like other Mumbaikars, I took Dharavi for granted. It was a place that one just passed by, either in disdain or disgust. Stories of the underworld and mafia dominated the narratives of Dharavi. Dharavi was the go to place, for people who came to Mumbai with dreams of a better life, but chose to stay there or the surrounding areas for the cheaper rentals. In 2007, when we launched Radio Active 90.4MHz, a community radio station in Bangalore, many communities that we invisiblize, based on our perceptions, came to the forefront. Though my tryst with waste started in 2009, Mumbai and Dharavi were never in the immediate picture. It was not till 2012, when one of the optional tour components of the Australia India Youth Dialogue was the Dharavi Tour that I saw Dharavi with new found respect. According to Pieter van Beukering is a Dutch economist, “Solid waste has three outlets: formal collection for disposal by the municipality, informal sector recovery for recycling and waste that remains uncollected. While the former and the latter always occupy space in popular media, the second outlet continues to remain invisible, which Dharavi stands testimony to. The sheer industriousness and determination, is what makes this place a vibrant recycling hub. 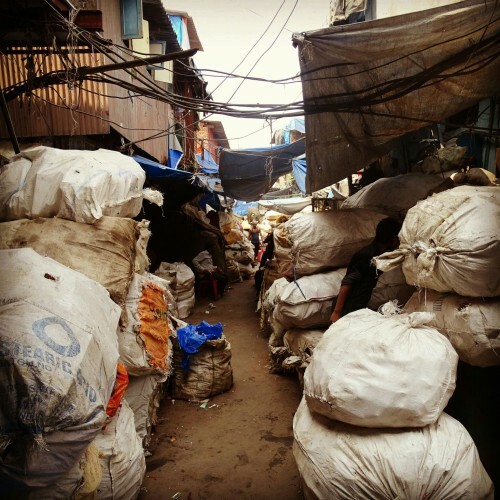 Walking through Dharavi, our minds whirled with questions… though the informal sector exists in all developing countries, what makes their work invisible? What problems do they face? Why is the sector so fragmented? Does social exclusion make it impossible for them to access better technology, credits or markets? What bargaining powers to these people have – when it comes to space or welfare schemes?